Bring the people you love closer to your heart by gifting this Appealing Ladies Hand Bag in Grey and Orange Stripes loaded with your affection and fondness for them. 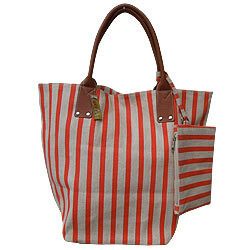 This bag is a Grey color bag with Orange stripes and a Brown color handle. This bag is made of best quality leather.